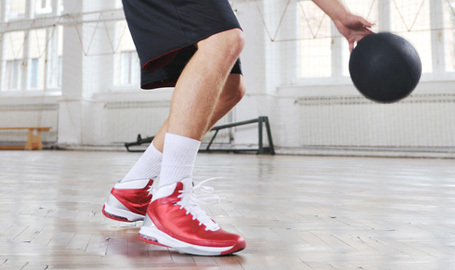 Basketball is full of demanding jumps, fast movement and rapid stops that add up to a high risk of injury. Footbalance custom insoles support your feet properly for better stability, shock absorption and injury prevention. Misalignment in the feet and ankles affects overall body alignment and efficiency, impairing jumping power, shock absorption and stability. Without proper support the ankles, knees and hips turn in, impairing natural shock absorption. Normally, landing a jump loads your body with five to eight times its weight. Misaligned feet transfer a greater percent of this force to the rest of the body, over time leading to premature wear on joints, soft tissues damage and pain, and greater susceptibility to injury. Jumping take off forces get directed inefficiently, wasting energy. Running efficiency also diminishes, further decreasing stamina. Poorly fitting footwear makes things worse, raising the risk of accidents or injury during rapid starts, stops and running. Footbalance insoles support your feet in proper alignment for more efficient jumping, better shock absorption and improved stability. When your feet and ankles are properly aligned your entire body is more biomechanically efficient. Maximal power transfer for jumps is possible. On landing, your feet absorb shock as they should, reducing unnecessary stress to the ankles, knees and hips. Overall running efficiency also improves, helping stamina.